I came across Vedantic Meditation by David Frawley in Goa, India. It’s a lovely little book mostly of 2 and 3 page chapters that begs to be dipped into for quick inspiration. Browsing in a largish, malorganized bookstore in the city of Panjim, I pulled it off the shelf and opened it to a page with the heading The Consumer and the Consumed. I was very taken with Mr. Frawley’s perceptive analysis of the consumer mentality and it’s effects in a few concise paragraphs. Of course, being the good consumer I am, I had to have it! As I was reading this chapter in the bookstore, I received a call from a friend who knew I was at the Panjim bookshop and wanted to know if I would look something up for her. And can you guess? It was a David Frawley book. As these things happen, I thought it was some kind of synchronistic sign and the phone call sealed the deal. Unfortunately, they didn’t have the book my friend was asking about. Sorry, Marci. All consumption is a kind of eating, in which we ingest some product from the external world. In the process we become more material, heavy, dense and dependent. The consumer is the consumed. To be a consumer is to be involved in a process of destruction. Consumption occurs as the inertia of matter feeding on itself. Eventually we ourselves are thrown away like yesterday’s newspaper. In the process of consuming things, our life and creativity are eaten up by commercial forces and worldy interests. We take in temporary sensations or ideas that keep us distracted, removed from our true Self and its nobler aspirations. 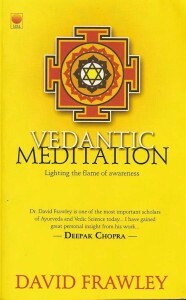 Vedantic Meditation: Lighting the Flame of Awareness at Amazon.com.